This is a delectable disc. The Mozart is still available in the UK on the Decca Twofer Series. There it is coupled with other Mozart wind concertos, in similarly fine performances (Decca 466 247-2) but at a much higher price than is being asked for this disc. Last year (2004), it was also available, coupled with the Sinfonia Concertante with the Oistrakhs, with the Moscow Philharmonic under Kirill Kondrashin, but this appears to have been deleted. Neither the Spohr nor the Weber concertos are available with this soloist, which is a shame as these are all superb renditions. This performance of the Mozart concerto was always one of the finest, often being compared with the Jack Brymer in the days of LP. 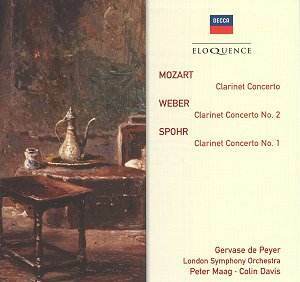 What often swung critics towards the de Peyer, was not only the warm, lucid tone of the soloist, but also the playing of the LSO, then at one of its peaks, conducted by that outstanding Mozartean, Peter Maag. Although not a period performance in any way, since the recording was made before that movement got underway, I know of no other performance, except Brymer�s that gives me more pleasure. The phrasing of both soloist and orchestra dovetail almost seamlessly and the performance is a constant delight. Maag�s accompaniment is light and airy and superbly caught by the Decca engineers. This is a Kenneth Wilkinson recording � need I say more! The other two concertos are equally enjoyable, and it is very pleasing to be able to welcome these stylish performances back into the catalogue. Recorded about the same time as the Mozart, albeit in a different venue, the recorded sound is slightly less airy than that captured in the Kingsway Hall. This effect is so slight as to not make any decisive difference to my recommendation. These performances were recorded during Colin Davis�s early conducting career when he was making superb records for both EMI and Decca. This is another of these. The Weber Concerto was written for Heinrich Bärmann, a famous Munich-based clarinettist. In traditional three movement form, Weber superbly shows off the virtuoso characteristics of the instrument as well as producing a well written and charming piece of music. Relatively speaking Spohr has been eclipsed since his day; a shame, as he was well thought of when he was alive. If this is anything to go by, the clarinet concerto will in no way supersede the Mozart work. It is however good enough to be counted in the same company as the Weber. Colin Davis accompanies his soloist superbly. This is another bargain from Down Under and deserves a place on our shelves. Highly recommended.